Re-Creations in Glass: "THE MARNIE"
To be notified of new posts, please enter your e-mail address below. It is not shared with anyone. Everything on this site is one of a kind. Each creation is made with heirloom, vintage, and/or found glassware, re-purposed for contemporary living--some with a little whimsy. These creations are designed for indoor or outdoor use. An industrial adhesive is used, which enables them to withstand variations in temperatures. However, some combine crystal with other types of glass, so in extreme temperatures, removing them to a moderate environment would be advisable. Some of these items can have multiple functions. 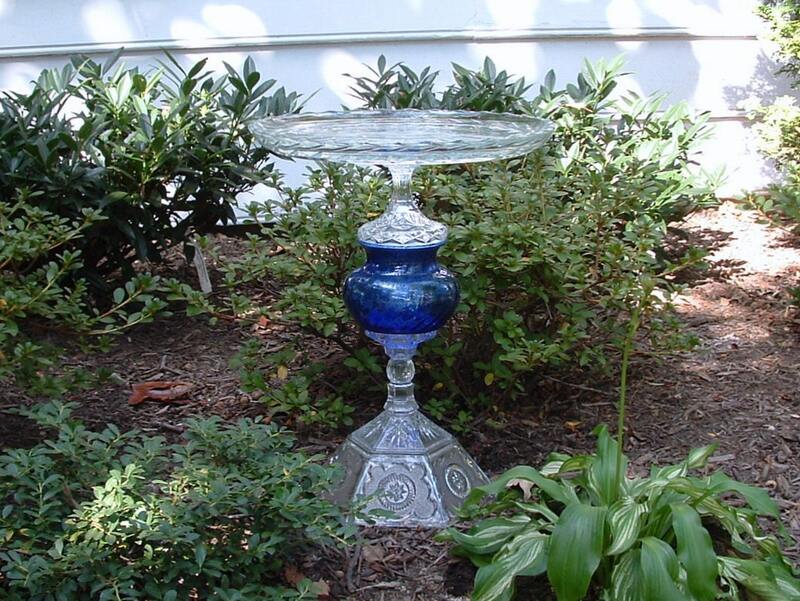 Indoors, a pedestal stand could be for food display or used for a chair-side table; outdoors it could be a birdbath or plant stand. The flowers in particular can be used as a low centerpiece with a votive candle, but are gorgeous as they catch the light when hung on a wall indoors or fence outdoors. Or, each piece can just be what it is--an interesting and curious use of vintage or recycled glassware. No doubt you may find other purposes for what catches your eye. My re-purposed art is beautiful among plants indoors or out. Similar items grouped together can be a spectacular display (and conversation starter)! And of course they make great gifts for weddings and special occasions. Thank you for your interest in my Re-Creations In Glass.